Thanks to the unscheduled powercut last evening, friend & I decided to get out of the house, go somewhere with AC and when I mentioned not having been to Vijaya Forum Mall, that is where we headed to. From the exterior appearance to the main entrance, I felt like I had been transported to Bangalore Forum mall [Hosur road]. The place is huge, we did spend a bit of time checking out some stores, did some shopping as well. And before leaving, decided to grab some dinner [take away]. This is when we hit the Foodcourt, and my friend mentioned Sbarro and how good their pizzas are. Though I am not a pizza fan, decided to give it a shot and was not disappointed. This is the only place [outside of that one stall in bessie beach] where I saw pizzas being sold by slice. They had about 4 kinds of Veg pizzas and 3 Non veg pizzas on display. Apart from this, I also spotted another counter with 2 kinds of pastas, different sauces and veggies. Interesting~! 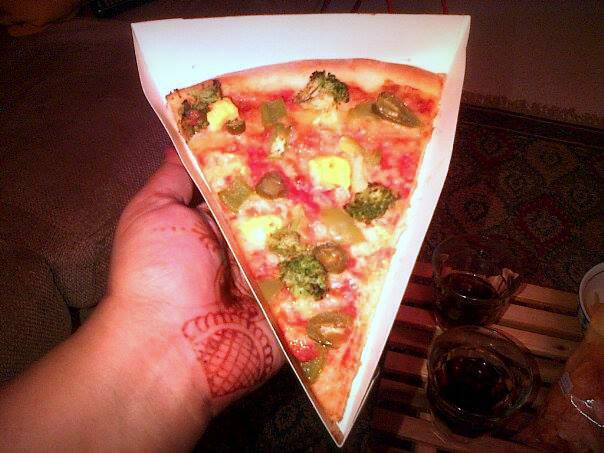 I ordered for 2 slices of Paneer & Brocolli, while the friend ordered for Margarita, Standard Veggie and a Chicken pizza. Took them about 10 mins to get the order ready, we grabbed our bags and got out of there.